There are several ways to add transactions to your accounts. From the activity menu inside an account's transaction list choose "New Transaction" or "Transfer Funds"
Optionally you can enable a "+" button on the lock screen in the settings menu that allows you to add transactions on the go with out having to unlock the app. Choose any of these and you'll be presented with the transaction editor. Your default account will already be selected if you've chosen from options 2 or 3 above, but you can tap to change the account. Choose a transaction type from Money Pilot's default types or create a new transaction type if needed. Todays date is selected by default for you. 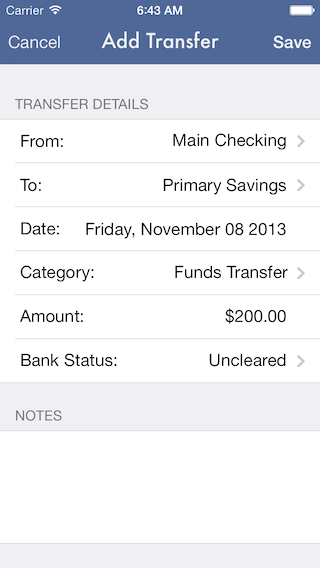 Tap the Payee/Payor line and you'll be presented with a smart auto complete enabled textfield to enter the name in. Any applicable payee/payor you've used in the past will appear in the list as you type. Choose an expense category from any of the provided defaults or create your own category. Enter the total for the transaction and optionally if your using the reconciler adjust the Bank Status if needed. Click Save and you are done. For frequently used transactions you can create Favorite Transactions from existing transactions or make one by choosing a type, category, account and payee. Once created you can choose a Favorite Transaction that will fill in all details for a new transaction but the total with a single tap. For transfers you'll be presented with a similar transfer editor that will make the transactions in both accounts for you. To view the details of your transactions just tap on in the list and you'll be presented with a detail view of the transaction. In the Nav Bar of the detail view is an action button that will present you with the various activities you can do to the transaction. You can delete transactions simply by swiping them on the transaction list. In the Settings Tab>Data Management you will find areas to add, edit/rename and delete Transaction Types, Expense Categories and Favorite Transactions.